You are here: Home » Birds » Ruby-throated hummingbirds: tiny energy! A female rub-throated hummingbird sips from a garden flower. A. Stinnissen photo. There are only a handful of birds that captivate us to such an extent that we wear clothing, drink from china cups, wear jewelry and purchase paintings and other items adorned with its image. Hummingbirds have to be positioned near the top of that list! Weighing in at between .1-.3 ounces (2.5-8gms), the Ruby throated hummingbird is one of the world’s smallest birds. The Hummingbird family comprises 320 species in the Americas, but only the Ruby-throated nest in Ontario In some of the southern states as many as 125 species have been recorded. The greatest concentration of hummingbirds is, as expected, in tropical countries. A question I am frequently asked is why hummingbirds would ever want to migrate from the tropical countries with their abundant, year round, food supplies, to relatively cold Ontario each year. One of the major reasons is the extended daylight hours which we enjoy. During the rearing season, Ontario offers 16-18 hours of daylight in which the birds can collect food for their young. In the tropics, daylight hours are reduced to 12-13 hours at most. This adds up to almost half again as much time per day for parents to collect and provide food for a growing brood. It also enables them to have two broods per year. The perils of migration are well worth the risks. These little jewels of nature arrive here with the first blooms of spring. The males arrive first, followed by the females a week or so later. Ruby-throated hummingbirds do not form pairs. However, they do engage in spectacular flying courtship routines, both males and females, flying up and down and chasing each other and flashing wonderful iridescent colours at each other, prior to mating. The female will build the nest of webs, mosses, lichens and the soft fluffy material from dandelion seeds, all held together by spider’s web, which will enable the nest to stretch as the young grow. She will lay 1-2 tiny white eggs and incubate them for 12-16 days. The young will fledge in 20-25 days. The female cares for the young exclusively. Meanwhile the male will collect a harem, breeding with as many females as he can. We are captivated watching these diminutive marvels as they hover, collecting nectar from flowers and sugar water from feeders. With wings beating in excess of 80 times a second and the heart pounding at more than 20 times a second, not only can they hover, they can also fly backwards, up and down and even upside down! 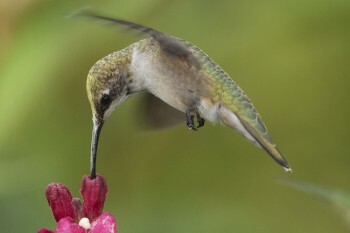 You can attract these most beloved of creatures to your garden or apartment balcony by providing hummingbird feeders filled with a sugar/water mixture of 4 parts water to one part sugar and by planting flowers known to attract hummingbirds such as: columbine, bee balm, fuchsia, cardinal flowers and many others. They are attracted to most red and purple flowers. Should you want to add some additional enjoyment to hummingbird watching, try photographing them. It makes for great fun and satisfaction as Orillia Wildlife photographer Arni Stinnissen can attest! This entry was posted on August 8, 2012 at 4:29 pm, filed under Birds and tagged birds, flowers, hummingbirds, nature. Bookmark the permalink.